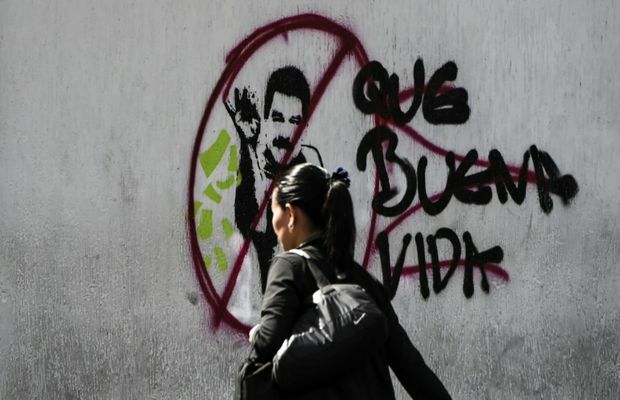 A woman walks past graffiti of late former Venezuelan president Hugo Chavez in Caracas on Feb. 6, 2019. Washington is prepared to exempt Venezuelan military leaders from punitive sanctions if they recognize opposition leader Juan Guaido as the South American nation's interim leader, President Donald Trump's national security adviser said Wednesday. Re Canada’s Leadership On Venezuela Is Misguided – And A Mistake (Feb. 6): Like Latin Americanist John Kirk, I cringe as Canada races into the fray of the Venezuelan crisis (as though this were a new development, not one more than a decade in the making), and with so little understanding of the region and its Cold War history. While it is clear to many that Nicolas Maduro should go, we must be careful not to repeat mistakes. When Foreign Affairs Minister Chrystia Freeland and others encourage the military, and when they align themselves with regional governments whose own human-rights record and discourse are so antithetical to our own, I, too, am troubled by Cold War hauntings. While I share professors John Kirk and Stephen Kimber’s fear of U.S. intervention in Venezuela, I wonder if their advocacy for a “made in Venezuela” solution rather means a “made in Venezuela and Havana” solution. Yvon Grenier, Professor, Department of Political Science, St. Francis Xavier University; Antigonish, N.S. Nicolas Maduro was probably re-elected as president of Venezuela in May, 2018, largely because he had placed the main opposition leader, Leopoldo Lopez, under house arrest. Most Western countries accordingly refused to accept the vote. John Kirk and Stephen Kimber describe this kind of election conduct as an irregularity. So how can I take the rest of their article seriously? They say that 5.8 million Venezuelans voted for Mr. Maduro – but how many of those were bribed or coerced? Tuesday’s editorial, The Argument For Change In Venezuela, cited a poll that found 80 per cent of Venezuelans now want Mr. Maduro gone. Is that not a more accurate reflection of current public sentiment? Professors Kirk and Kimber also suggest that Canada is being drawn into providing cover for possible U.S. intervention, but a more cogent argument would be that Canada is trying to head it off. They complain that Canada is allying itself with unsavoury regimes such as Guatemala, Honduras and Brazil, but more than a dozen EU countries allied themselves with the Lima Group on Monday. Mr. Maduro’s supporters are Russia, China, Cuba and Turkey – all authoritarian regimes. Is that the group the authors are more comfortable with? Their solution is mediation from Mexico and Uruguay, but surely that is exactly what the Lima Group wants to accomplish. Contrary to the professors’ assertion, this kind of leadership is exactly what Canadians expect, and this Canadian is very proud of his country’s actions on this file. Re ABC’s Of Free Parking (letters, Feb. 6): Robin Pilkey, the chair of the Toronto District School Board, makes a good case for having parking available at schools – but why should that parking be free? That encourages teachers to drive. Teachers using other forms of transportation are not offered an equivalent freebie. The school board policy is simply not environmentally friendly. Why not charge for parking, give all staff a transportation allowance and let them decide how to spend it? A judge’s decision to allow a painting by a French impressionist master to be sold to a buyer outside Canada has thrown a wrench into the system of funding acquisitions by public galleries across the country (Hanging By Threads – Arts & Books, Feb. 2; Art In, Art Out – letters, Feb. 5). The judge could not see why a French painting could be considered so significant a piece of Canadian cultural heritage that it shouldn’t be allowed to leave the country. The consequent problem is that the set of criteria used to determine “exportability” is the same set of criteria as those used to determine whether a painting donated to an art gallery is worthy of the tax breaks that nudge owners to donate their valuable pieces to the local gallery. The fear is that the donation process will be sideswiped as a result. Isn’t it as simple as establishing two independent sets of criteria: one to determine whether a work of art is “Canadian” enough to require that it be kept in the country, and another (possibly enhanced from current criteria) to determine whether the work is important enough, regardless of its origin, to grant the rich tax breaks necessary to ensure such works find their way into our public galleries? Re Tilting At Windmills Won’t Solve Health Woes (Feb. 5): André Picard says that we never get round to solving the real problems of Canada’s health-care system. The World Health Organization gives a high rating to services provided by countries such as France and the Scandinavian nations. How is it that Canada seems to be unable to emulate the quality health-care services available in such countries? The establishment of user fees for health care would help us realize that health care is not “free,” but is in fact one of the largest draws on our precious tax dollars. With our aging population, the situation is poised to become far worse. How are we going to pay for it all? Hiding health-care costs from consumers as we do blinds us to some of the extant realities of life in Ontario, and in Canada. Conversely, employing modest user fees would help us appreciate that nothing is “free” in this world (except oxygen, so far), and that health-care beds (in hospitals and in other health-care facilities), and our visits to doctors’ offices and emergency wards, carry with them very significant, increasingly unaffordable financial aspects and penalties. May I suggest that she was in fact an inspiration to every little girl with a pair of skates, as evidenced by the best-selling Barbara Ann Scott doll referenced in the next sentence. Envy destroys, inspiration builds … small words, big difference.